Warner Bros. Television and the estate of author J.R.R. Tolkien have been shopping a Lord of the Rings TV series, with Amazon emerging as a front runner while Netflix is also considered to be in the mix. No deal has been set in stone yet, but a new report reveals that whoever ends up with this series will have to plop down some big bucks, with the network or streaming service who lands the show expected to pay a massive upfront rights payment between $200 million and $250 million, which is one of the biggest deals in TV history. That payment is just for the rights to the show, based on J.R.R. Tolkien's books, with each season likely costing anywhere between $100 million and $150 million to produce. While Amazon and Netflix are both in the running for this show, a report from Deadline claims that HBO was in the mix but they backed out because of the deal's massive finances which some industry insiders have described as "insane." The HBO pitch reportedly involved producer Jane Tranter whose company is partially owned by HBO and Sky, although there is no general talent attached to the project at this time. What's even more interesting is that this massive deal wouldn't even include the rights to all of the Lord of the Rings characters. As of now, there is no story concept attached or creative talent such as writers or producers, so this massive payment for the rights would basically have to be made sight unseen, with nothing to go off of except for the potential for the sprawling franchise. Amazon's Jeff Bezos has given the streaming service a mandate to create a sweeping fantasy epic along the lines of HBO's Game of Thrones, which is what makes Amazon an ideal partner for a show like this that delves into Middle Earth, despite the spendy price tag. Jeff Bezos is said to be very hands-on with his entertainment division, in the wake of its top two executives including the ousted Roy Price, after allegations of sexual misconduct came down. Still, Amazon has shown that it is willing to shell out some major dough for their original programs. 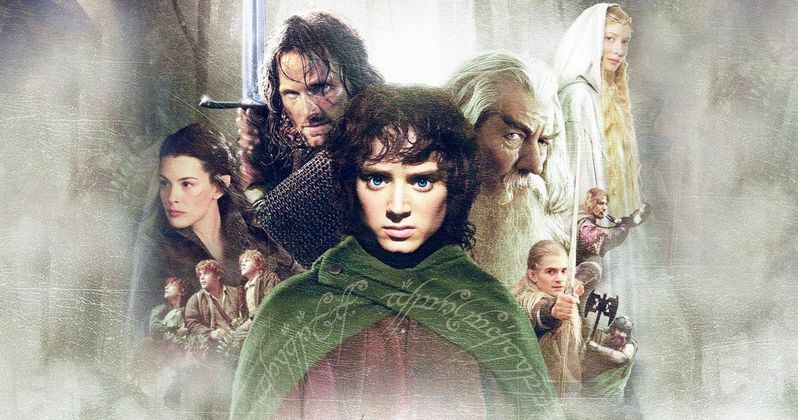 The Lord of the Rings series would dwarf the $80 million commitment for Woody Allen's six-episode series Crisis in Six Scenes, the $70 million it paid for Matthew Weiner's The Romanoffs and the $160 million it earmarked for two seasons of a David O. Russell series, although that is not moving forward anymore after $40 million was spent in development. This comes as Fox Searchlight mounts their J.R.R. Tolkien biopic. No story details for the series were given and it isn't known if they will connect to the Lord of the Rings movie trilogy. This comes after Warner Bros. and the Tolkien estate settled a lawsuit that had been fought in court for five long years, with the studio and the estate now working together on this upcoming TV series. Since no creative talent has been attached, it remains to be seen if Peter Jackson, who directed all three Lord of the Rings movies and The Hobbit trilogy as well, will be involved in the project in some way shape or form. The three Lord of the Rings movies earned $990 million domestically and $2.9 billion worldwide. The Hobbit trilogy didn't fare quite as well, earning $816.4 million domestic and $2.9 billion worldwide. https://tvweb.com/lord-of-the-rings-tv-series-amazon/|TVweb has more details on what's being rumored.